With Music2PSP copy your music very fast and comfortable on your MP3-Player and PSP. MP3-, WMA- and OGG-files. Freedb-access for labelling and Download of Album-Covers. With the advanced ID3-Tag-Editor you can embed these album-covers in your existing MP3-files. Manage several Playlists, if it is supported by your MP3-Player. Create your own Playlists and customize the order of the songs in the way you want to listen to the music. 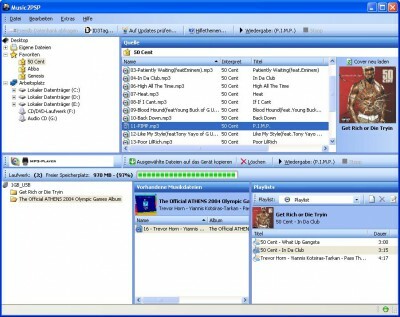 MusicIP Mixer is an easy to use application which allows you to manage your music collection. Complete your album artwork collection with the highest quality album covers.